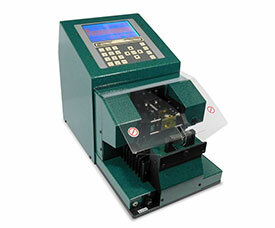 The new Model 970 Compu-Strip© is a fully programmable bench top Measure, Cut & Strip Machine. 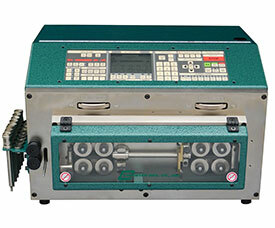 The Model 970 uses high torque stepper motors, belt feed material transport, and a precision ball screw blade mechanism. The Model 75 Compu-Strip© is a fully programmable bench top coaxial & triaxial cable stripper that utilizes unique obiting blade technology. The orbiting blade technology greatly increases blade life and ensures clean, square strips. The New Model 80 Single Bowl Coiling System is designed to neatly coil long lengths of wire and cable. When interfaced with Carpenter's wire processing equipment the Model 80 automatically starts and stops providing a precisely wound wire coil. View our complete line of products here. All of our wire and Cable processing machines are designed and built in Manlius, New York for fast on time delivery.